Learning Health Systems are sociotechnical systems, and would have interdependent social and technical arrangements for feedback into practice. Therefore there should be significant thought about the implications from both of these viewpoints when considering the implications for adoption of changes within the healthcare system and the interaction between the user and the system. The barriers to translation into practice will vary depending on the domain of health services. Experience and conclusions from early examples of LHS in other countries may have significant cultural differences that may not apply to the NHS. Likewise different disciplines of healthcare may need different approaches, for example, it was thought that what may work in a surgical setting may not be appropriate in a general medical setting due to pre-existing differences in practice. There was discussion around the potential methods for feedback into practice. This focussed on publications, guidelines and decision support systems. It was felt that publications represented a very slow method for translation into practice and concerns about the limited impact publications can have on everyday practice. Decision support systems could incorporate guidelines produced by bodies such as NICE however different approaches to these systems may be appropriate in different settings, with the need to incorporate social and psychological sciences and behaviour change approaches as appropriate to the care setting. The LHS is pushing into a world where there are huge numbers of people who are extremely skilled already. There are strong cultural traditions about what the nature of their work is, what their responsibilities are, what machines could possibly do. That is supported by patients who expect certain things from the role of the clinical professional. At the individual human level, there may be difficulties in achieving change and learning how to overcome the obstacles that our technology simply does not fit with our human way of thinking. Healthcare is a very complicated system in which everything is connected to everything else. There are a lot of variables that are connected and changing one part of the system will cause change in other parts. It is hard to see how change like the LHS can be introduced without having significant effects on other parts of the system. There will be many socio-technical constraints with resistance to change from existing actors with varying levels of power. 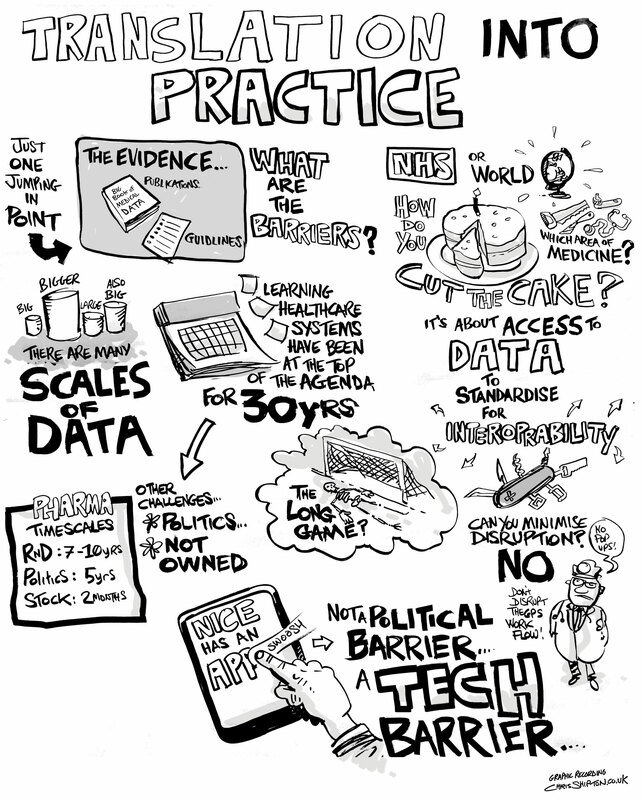 It will be increasingly difficult to align clinical practice in healthcare with the data available. EHR is difficult, genetic data will be another level of difficulty and proteomics will be another level beyond that. What will it mean for work practices when district general hospitals are using this sort of data? In order to make this transition possible, there is also a need for easy access to clinical data, which is in standardised and open formats, allowing for interoperability. If these systems are to be successful it is important that they can communicate to each other through standardised medical terminology and this is a huge technical problem. Without this, it is difficult to get any lift at all and this requires a cultural shift for the organisation to become a learning system. The NHS began to call itself a learning organisation in strategy documents around 30 years ago, yet there is still a lack of rapid feedback mechanisms in place today. There were concerns that the NHS has forgotten the lessons that it has learned during this time. It is very easy to talk about being a leaning organisation in a strategy document, but these problems are increasingly complicated and the actors do not necessarily see themselves as learners. There is no central ownership of the need to learn and it is divided among multiple areas which may not coordinate effectively. In the complex problems of healthcare delivery, there may not be right or wrong answers. We need to look at what is working in real life by developing an appropriate body of knowledge. The problems are changing all the time, so we cannot just say this is the problem, this is the way we are going to tackle it, here is the solution. It must be much more evolutionary than that. The current healthcare system was not configured to learn effectively. It was felt that there is a need for gradual incremental change towards a learning healthcare system. This cannot be achieved quickly, but traditionally, research is a short game, with funding for typically 3, 4 or 5 years, which in itself presents challenges in how to translate the potentially valuable findings into practice, particularly when funding reaches an end or there is a need to move onto the next project before potential outcomes are fully achieved. At the same time, learning does not take place over convenient political timescales of 5 years and certainly not at stock market timescales of just months. We see the often quoted figure of 17 years from laboratory research to traction in everyday practice. There was disagreement over whether there had been lessons learned from failed national programmes. Some of the group felt that there are positives to be found even in the ashes of the supposedly failed national IT programmes, but the evaluation must take the long view. Others were of the opinion that there has not been adequate learning from such failures. It was observed that NICE produce world leading clinical guidance and the technology exists to make that guidance machine readable, so that it could power decision support tools, but this has not happened. The group explored the hypothesis that this was because of the political ramifications of being seen to tell doctors what to do. The feeling was that this was not the case and that the real barriers were around the technical issues of compatibility across devices and access to devices in clinical practice. However, some progress is being made in this direction. In terms of decision support more broadly, it was felt that the “pop-up” approach to decision support has been misguided because clinicians don’t like it and simply click it away. A better approach may be to provide end of week prescribing reports or periodic bonus rewards for those who are performing well. We need to deliver decision support in a way that there is not going to be push back from staff. Pop-ups were seen as the Holy Grail in decision support but when they are implemented they are ignored 90% of the time. It is particularly bad for patients with multiple comorbidities who trigger multiple pop-ups. “We all believe in decision support, but the subtlety is in how we deliver it”. There is a real need for human factors engineering here to take account of how technology will disrupt workflows, thinking patterns and team dynamics. The aim of using IT to develop a LHS was framed 40 years ago. The global healthcare IT industry is now worth over $50bn/year and we have had 4 national IT programmes since then, but we are still not learning from data. We urgently need much more insight into why we are not learning. The learning will never be perfect because we live in a complex world but we need to continue to press for progress. There is also a need to be clear about what success in a LHS would look like. There was interest in how the LHS might manifest itself. One idea is that lots of products will form an ecosystem around the LHS. Each product would provide a service and there may be competition between products. There is an important question over who will own the platform on which the ecosystem exists and what sort of market power they will have. Discussion about centralised and distributed systems was thought to be old fashioned. An example used to demonstrate the role of a platform was HANDI Health (http://handihealth.org/) which is trying to create a platform for an open source, open access process for developing and disseminating health applications. This was felt to be an effective method for developing new technologies that could help facilitate learning. This led to discussion around the role of the platform and the commercial interests in providing a platform for development. It was felt that there should be a minimal core provided by the platform which encourages use and makes development possible, however the value of the platform is generated by developers working within the platform rather than by the platform itself. It was felt that the role of the platform was to provide this minimal core and not to encroach upon the development work using it.